This popular annual event will be held on May 3-5, 2019. The three-day event is packed full of something for everyone including music, food, rides, games and a raffle. Food booths will include Cajun, Italian, American and Fun Foods. There will also be some Fiesta-themed foods. There will also be ice cold soft drinks, beer, and other adult beverages. Don’t forget to stop by our frozen foods booth and sweet shop! You can get something to munch on at the festival and purchase some delicious food to take home to your family. The Chee Weez will be performing on Friday night. We will also have the Horseshoe Tournament again this year! On Sunday afternoon, May 5, our festival will conclude with a cash raffle drawing. You do not have to be present to win. Get your tickets now. We are in the midst of planning for this year’s 11th annual Festival of Two Rivers activities. As you know these events are only possible by the many volunteers that step up to assist with all the activities. We are going to utilize Sign-up Genius again this year for volunteers. It will expedite the volunteer sign-up process by creating an online sign up form which allows the individual to select the date and shift you are available. We have developed a sign-up for the concessions (food & drink booths) another sign-up for manpower and another sign up for the games. Festival Dates and hours needed: May 3rd (4:45 PM - 11 PM), May 4th (10:45 AM - 10 PM) and May 5th (10:45 AM – 5:00 PM). We are asking you to complete the sign-up ASAP, but no later than Tuesday, April 30, 2019. The directions for Sign-Up Genius are noted below. If you have any questions, please contact the volunteer coordinator, Kyle Cutrer at kylemcutrer@gmail.com. Volunteer forms are available in the church office, if you prefer to fill out a paper copy instead of using the computer format. We are asking the parents of our school children and CCD children to please make the game booths your first priority for volunteering. We would ask each child’s family to work at least one 2-hour shift in the game booths. Although, if there are parishioners without children in our school or CCD classes that would like to volunteer for game booths, so please feel free to do so. Please select the link to the sign-up sheet for the area you would like to volunteer. Once you select the link you will be able to view the volunteer schedule. Next to each time slot it will indicate the number of volunteers needed, select the date and time you are able to volunteer. You will be asked to enter your name, email and telephone number. The online schedule will only display your name. The email and telephone number is only available to the volunteer coordinator and chair persons for the events. Note: there are different links depending on where you would like to volunteer. We would like to thank those of you who have already returned your tickets or picked up your raffle tickets in lieu of us mailing. The tickets not picked up were mailed on Friday, April 5. If you are in need of additional tickets they can be obtained from the church office or by contacting Lisa Deaton at 225-933-3242. Many of you have already returned your sold tickets. If you have not returned your tickets, you have three weeks left until our drawing on May 5th at approximately 4:45 PM at the Festival. You may drop them in the collection basket or the church office. According to the state gaming rules we are required to have all unsold tickets returned, therefore, we are asking you to send any tickets you are not planning to sell or buy ASAP. There is a box in the gathering space of the church labeled cash raffle tickets, that you may drop unsold books of tickets. We are on a mission to gather items for our craft booth for the Festival of Two Rivers on May 3-5, 2019. Ideas for items: Quilts, religious or handmade jewelry, afghans, plastic grocery bag holders, needlepoint items, potholders, carved wooden items such as crosses, homemade candles, any trendy craft items, deco mesh wreaths, artwork, jewelry holders, pottery, embroderied baby gifts, etc. Also, please consider plant donations for our plant booth. Ideas include plants that are potted, such as tomato plants, houseplants, rose bushes, small trees, shrubs, annuals, and ivy. We will set up a time and place for plant delivery closer to the weekend of the fair. Please text or call Laurie Venable at (225) 937-2618 after 3 PM with any questions. Thanks for your support! 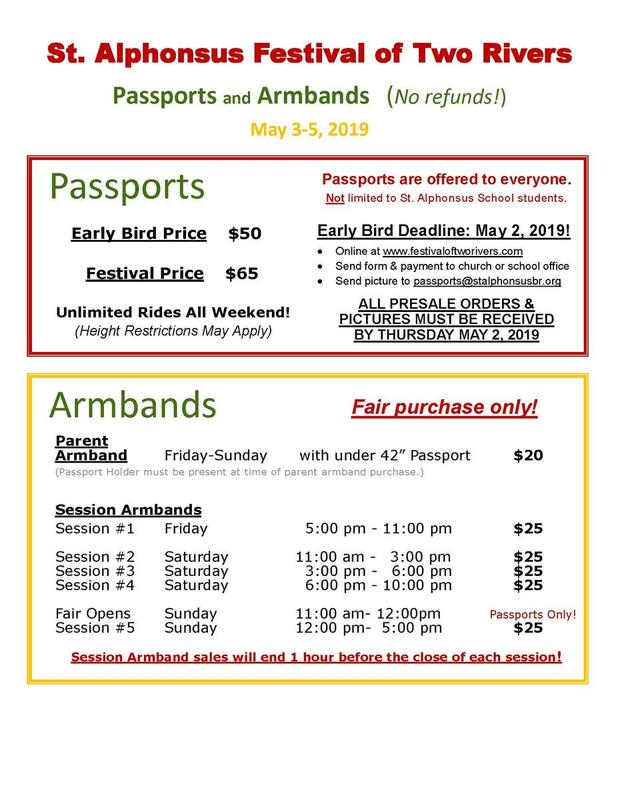 Passports can be purchased online through WeShare or by filling out the order form in the bulletin or in the Church Office and turning it in with payment by May 2nd.